So it’s 36,000 BP, and I’m living in my adobe brick house/mansion/castle, built on a picturesque spot located 2 miles west of what’s now the Savannah River and 1 mile north of the Broad River. A time tunnel connects me to the present in case of emergencies, but otherwise I’m living in an area of the world where there are no other people. In today’s world the only dangerous animals I’m likely to encounter are other humans and their dogs. Gangsters, twisted bullies, or psychos could assault me at any time, but I lower the risk by staying away from low income neighborhoods. Dogs are the only other animal to be wary of. A few years back, I had a neighbor who was freaked out because he saw a rattlesnake which he killed by driving over it. After this incident he seemed annoyed at me–I had let my garden get a little weedy and he spotted a corn snake in it. Yet, this snake-phobic honcho always let his pit bull terrier run loose. Luckily for me, it was only aggressive when I was behind the fence. It would charge and snarl at me as long as I was in my backyard, but when I went to get the mail the nasty canine would retreat and yelp in terror. In my Pleistocene world though I have no human neighbors and no pit bulls to worry about. Instead, there is the megafauna. 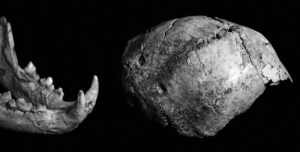 Skull of an australopithecus and mandible of a leopard. A leopard apparently killed this hominid. The skull has canine marks matching those of a leopard. Big cats hunt apes by attacking them directly from behind. Man-eating tigers are notorious for attacking humans using this tactic. It’s an intelligent strategy. Even a man with a gun would be killed easily. He’d have no chance to use his weapon. The walls of my Pleistocene adobe home consist of a double layer of the fat dried bricks. The windows are high off the ground and have steel bars over them. I feel safe inside. I doubt any predator would waste energy trying to dig through the walls. Likewise, my yard with livestock, a garden, grainfields, and a fruit orchard is surrounded by a high wall designed to make it difficult for animals to climb over. A safety problem arises, however, when I choose to make forays outside of my fortress. I use a steamroller to maintain a 3 mile dirt road between the Broad River and a chestnut ridge. I attend fish traps, and I like to take boat rides. And I survey plants and animals for scientific data. These activities take me into the danger zone. I’d definitely be carrying a Glock. Here are the top 10 most dangerous Pleistocene animals in this region that would keep me on the alert. 1-4. The big cats concern me the most. 4 of them are tied for first place–saber-tooths (Smilodon fatalis), scimitar-tooths (Dinobastis serum), giant panthers (Panthera atrox), and jaguars (Panthera onca augusta). A big cat could sneak up on me and jump on my back before I even knew it was there. I would have no chance to draw my gun or retreat to my vehicle. In India tigers learn to kill people by coming at them from directly behind. Some natives wear masks on the back of their heads–a tactic that confuses man-eating tigers and prevents attacks. An attack from behind would mean instant death. Pleistocene big cats in southeastern North America have not yet learned to fear man and might be more likely to attack than not. 5. I rank cougars (Puma concolor) behind the other big cats. Pleistocene cougars were on average 5% larger than modern cougars and probably considerably bolder, but still they’re a smaller cat that I might be able to box off me, giving me a chance to use my gun. Nevertheless, if one attacks me from directly behind, I’m in trouble. This rear-attacking tactic may be learned. Maybe naive Pleistocene cats would attack humans from the front. I can only hope this is the case. Photos from google images of elephants running amok. The man in the bottom image was killed by that elephant calf. 6-7. Mastodons (Mammut american) and mammoths (Mammuthus colombi) are in a tie for 6th place. I believe proboscideans unaccostomed to people would be peaceful animals unless protecting young–a situation easily avoided. However, when male proboscideans become ready to mate, they go berserk, attacking everything in sight, including other elephants, rhinos, and people. 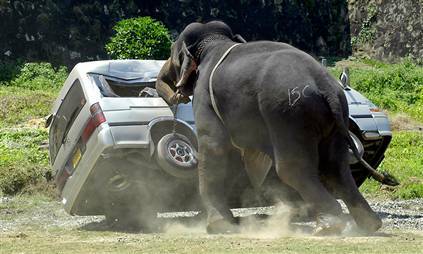 Even male elephants kept in captivity often go amok. Although I can see an animal this large approaching, a Glock might be an impotent weapon. A gunshot might just infuriate it more. And the great beast could overturn my vehicle, if I manage to escape inside. I wouldn’t want to face an angry herd of bovines. 8. Long-horned bison (Bison latifrons) were likely very aggressive animals–an adaptive behavioral response to an environment populated with lots of predators. I should be able to see them from a distance and avoid them. However, I enjoy eating steaks, roasts, hamburgers, and chili. If a bison wandered near my adobe home, I might want to shoot it for the meat. Its companions might hang around or return to protect the carcass. 9. Both black bears (Ursus americanus) and giant short-faced bears (Arctodus simus) could be trouble. I should be able to avoid these clumsy, noisy animals, but I better be on the lookout. A gunshot would probably just piss the thick monsters off. 10. Dire wolves didn’t use stealth, so I think I can avoid a wolf pack. I wouldn’t want one, let alone a pack, of these hard-biting brutes to get between me and my vehicle. I’m certain they’d have no fear of a man. They didn’t learn to fear men until it was too late. Prairie Violet (Viola pedatifida). Laura Ingalls’s little toddler sister wandered off and was found in an old “buffalo” wallow overgrown with violets–probably this species. It occurred to me that bison wallowing must have had a significant impact on the environment, altering the habitat so that it favored some species of plants and inhibited others. However, I didn’t think anybody had ever studied such an esoteric subject. Happily, I was wrong and found a recent study about bison wallowing published in The American Midland Naturalist. 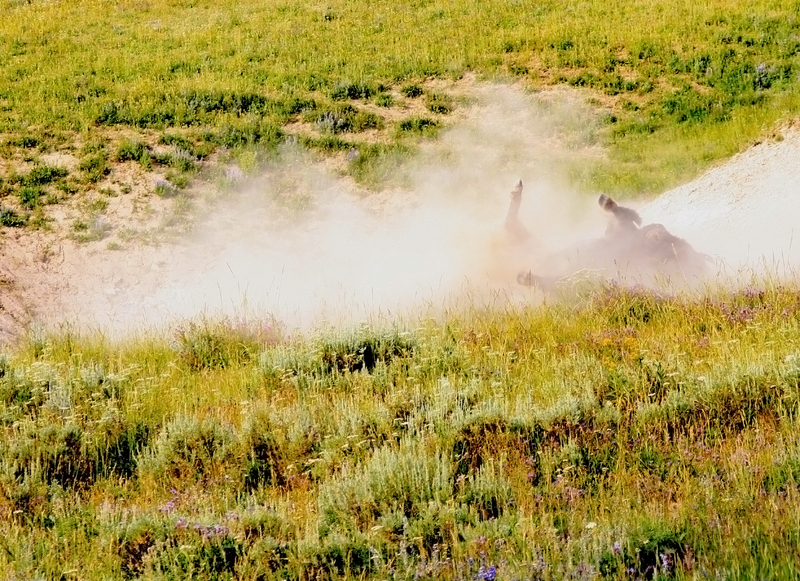 Photo of a bison wallowing from google images. Bison create wallows when they repeatedly roll and kick their legs in the same area to rid themselves of parasites, to scratch insect bites, and to give themselves a dust bath which may help stymie ticks, fleas, and flies. The wallowing forms circular depressions with compacted soil where water is retained longer than on adjacent prairie land. Some wallows are larger than 2 acres. There were millions of wallows across North America before the extirpation of the bison. Most have been plowed under but some still exist and are known as relic wallows. Cattle do not wallow, and accordingly, habitats created by wallows are limited to the few area where bison still exist. Scientists studied plant diversity at the Konza Prairie Biological Station in Kansas which is owned by the Nature Conservancy and managed by Kansas State. They compared the kinds of plant species found in active and inactive wallows and adjacent prairie. They counted a total of 153 species of plants of which 10 were found only in adjacent prairie and 25 were found only in wallows. Overall though, they found lower species diversity in active and relic wallows than in adjacent prairie. Bison rolling, compacted soil, and excess moisture is evidentally intolerable to many species of plants. Here’s a list of the 5 most common species of plants found in each type of habitat. Plant species diversity is also greater in grazed areas than in ungrazed areas. During the Pleistocene there must have been tens of thousands of bison wallows, some abandoned, some active across the southeastern coastal plain and into the piedmont. 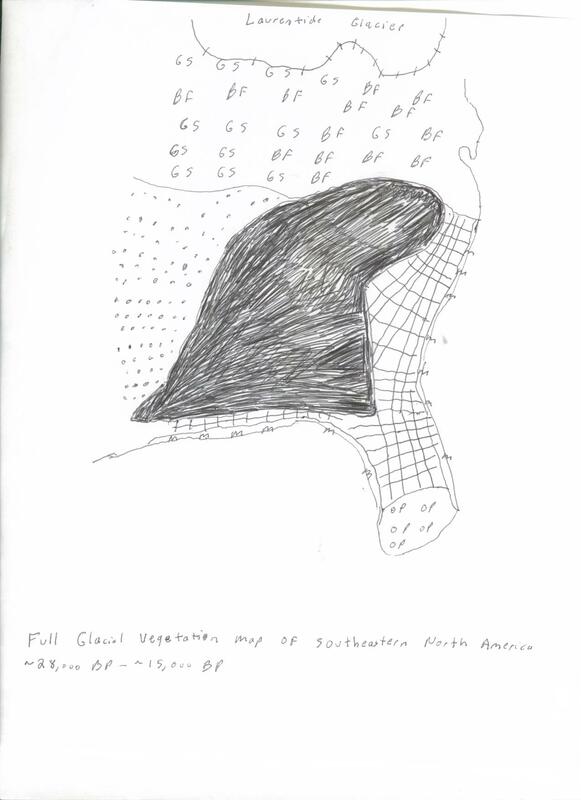 As I’ve noted in earlier blog entries (See https://markgelbart.wordpress.com/2010/06/11/were-there-three-species-of-bovine-roaming-southeastern-north-america-during-the-late-pleistocene/ and https://markgelbart.wordpress.com/2011/08/01/a-probable-pre-clovis-bison-butcher-site-in-washington/), I suspect there were 2 species of bison living in the region then. The two species may have hybridized in some areas, and the long-horned bison is probably ancestral to the shorter-horned variety. Long-horned bison (Bison latifrons) and northern bison (Bison antiquus) fossils have been found throughout the south, and they overlap geographically and temporally. Long-horned bison may have been more of an open forest species, while its cousin may have preferred more open grassland. Their wallowing behavior created habitats favorable for some species of plants and detrimental to others. The common plants found inside and outside of Pleistocene wallows in the southeast undoubtedly differed from the list of plants found in the modern tall grass praire. The composition of plants in Pleistocene bison wallows will likely remain a mystery. Here’s a better photo of a blue-winged wasp (Scolia dubia) than the one I posted a few weeks ago when I was showing how they destroy my grapes. This photo is from google images. A few weeks ago I gingerly picked grapes from my vine because yellow jackets and blue-winged wasps were also enjoying the fruit. It occurred to me that I knew nothing about the latter insect, so I mind-melded with google for some interesting facts about them. 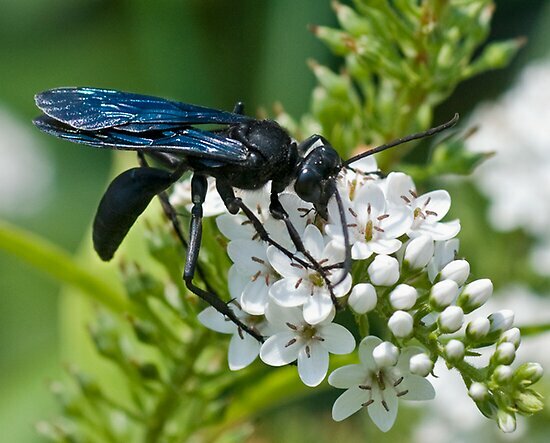 Blue-winged wasps are a member of the mutillid family which also includes velvet ants and cicada-killers–predatory insects that sting and paralyze their victims, carry them to underground lairs, and lay their eggs on them. The eggs transform to the larval stage and feed upon the helpless insect. That’s all the protein they’ll ever need. When they become adults they only require sugar for energy, explaining why the creepy creatures haunted my grape vines. Blue-winged wasps specialize in preying upon green june bugs. June bugs are a garden pest, so blue-winged wasps are beneficial insects. Photo from google images of a cow-killer ant, a kind of velvet ant (Dasymutilla sp.). They’re not actually ants but instead are wingless wasps. They’re pretty common in my yard. Cicada-killers (Sphecius sp. ), as the name would suggest, specialize in preying upon cicadas. But velvet ants, also known as cow-killers because their sting is painful enough to kill a cow (an exaggeration, of course) parasitize cicada-killers and bumble bees. They show no mercy to their close relatives, nor to their distant bee cousins. They are predators of predators. I often see these wingless solitary wasps scurrying about bare soil areas in my yard, especially where the grass has been killed by the cars I park on the lawn. (I purposely park on the lawn. Less grass to cut.) Bare soil was a common habitat during the Ice Ages. Frequent drought and megafauna overgrazing, trampling, and digging created many spots devoid of vegetation. Moreover, many species of wild grasses grow in clumps rather than forming carpetlike lawns. The mutillids like bare soil because it’s easy for them to dig their chambers without having to go through a grass barrier. Because favorable habitat was abundant during the Ice Ages, mutillids must have been as well. I didn’t think I’d find a Pleistocene angle for this group of organisms. Studies of Pleistocene insects are rare although there are some. Insects are less likely to be preserved than fossil vertebrate bone or shelled molluscs. I was surprised to find that there has been a study of Pleistocene mutillids. Scientists determined that changing Pleistocene climate phases increased species diversification of nocturnal velvet ants in southwestern North America where at least 300 species live. Speciation occurs more rapidly in the insect world because several generations of the short-lived creatures can live within the timespan of just a year, greatly speeding up the possiblity of evolution. Scientists used an analysis of velvet ant DNA to make this determination. Photo of a white spruce (Picea glauca) from google images. The extinct Critchfield’s spruce was similar enough to this species that scientists originally misidentified it as such. The size of the cones, cone scales, and needles differ to a statistically significant degree between the two. Critchfield’s spruce dominated lower Mississippi River valley forests during the Last Glacial Maximum (~28,000 BP- ~15,000 BP) and commonly occurred throughout the southeast elsewhere. That such a once abundant tree became completely extinct is surprising and a little unsettling. It means that common and beneficial plant species that we take for granted today could abruptly become extinct in the future. Since the 19th century Americans have already experienced the catastrophic loss of the American chestnut and are witnessing the perhaps irreversible decline of the hemlock–both due to human-introduced diseases and insects. These species have existed for millions of years. 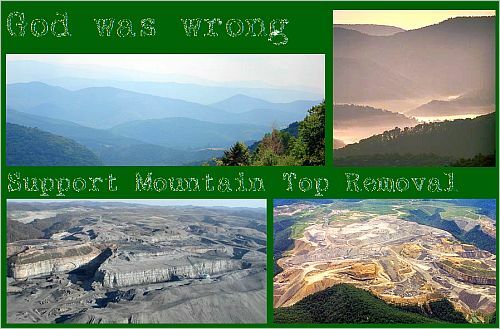 Our environment is becoming more and more impoverished. However, man is probably not the culprit for the extinction of Critchfield’s spruce. Fossils of Critchfield’s spruce have been excavated from the Tunica Hills region in Louisiana (as discussed last week) and Nonconnah, Tennessee. In both of these locations it was found in association with mixed hardwoods such as oak, maple, walnut, etc. In Georgia Critchfield’s spruce fossils were found at Bob Black Pond in Bartow County (northwestern part of the state) and Andersonville Clay Pit (southwestern part of the state). At the former site Critchfield’s spruce fossils were found in association with fossils of northern species of trees–pitch pine, jack pine, red pine, white pine, and white spruce. Evidentally, in the northern part of its range, Critchfield’s spruce overlapped with boreal species. To the east and west of these fossil localities remains of Critchfield’s spruce are unknown, but its presence can be inferred from the pollen record. Spruce pollen is present but not dominant in pollen studies from central and southeast Georgia, and South Carolina during the LGM. And there is a 12,000 BP pollen record in north Florida of an unusual forest consisting of beech, hickory, and spruce. The spruce pollen undoubtedly originated from the Critchfield’s spruce species. Scientists assume that unlike its relatives it was a temperate species. All the fossil wood from this species dates from 25,500 BP-16,000 BP, but spruce pollen continued to appear in southeastern pollen records until ~9,000 BP, indicating it survived until then. 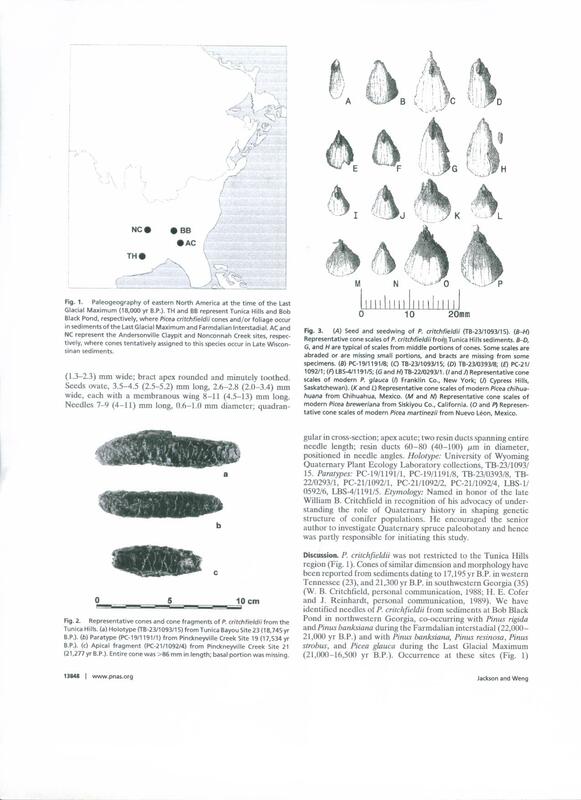 This is a page from the below referenced paper that diagnosed Critchfield’s spruce as a distinct species. Southeastern pollen records show an inverse relationship between spruce and oak. During interglacials and interstadials oak pollen increased while spruce pollen decreased. During stadials pine and spruce pollen increased while oak pollen decreased. Stadials were colder, drier, and windier, and had lower levels of CO2 in the atmosphere. Conifers are better able to grow in these conditions. Their springy limbs bend and sway in windstorms and icy weather; limbs from hardwoods more readily break. Plants need CO2 for respiration. The needles on conifers are more efficient at respiration than broad leaves, and they also lose less water during drought. In warm wet climates with higher CO2 levels broadleafed trees tend to outcompete and shade out conifers. This explains the cycle. Data from ODP (Ocean Drilling Project) 1059A (see my May archives for an article about this), the only pollen record in the south from 150,000 BP-50,000BP, shows that spruce pollen decreased rapidly following the end of the Illinois Ice Age and ranged between 0%-5% during the Sangamonian Interglacial and early Wisconsinian Ice Age. It didn’t rise significanly again until 70,000 BP when it reached 10%. Though Critchfield’s spruce must have declined to low numbers during the Sangamonian Interglacial, it didn’t become extinct as it did in the present one which brings to mind the question of why did it become extinct? The authors of the below referenced study give 3 speculative causes for its extinction. A pathogen spread as the climate warmed. Critchfield’s spruce failed to disperse and colonize newly available habitat–something other species of spruce did as the Laurentide Glacier retreated. And habitat space disappeared when broad-leafed trees outcompeted them. I would like to add some other speculative causes. It could have just as easily been an insect infestation as a pathogen in an environment with a longer time for a potential insect pest to reproduce. Maybe it was a pathogen spread by an insect or a pathogen plus an insect infestation. During previous interglacials broad-leafed trees very nearly outcompeted Critchfield’s spruce into extinction, but the latter survived in some refuge per chance. Maybe this time perchance it didn’t find that refuge. I doubt man played a role in its extinction, but there is a possibility Indian-set fires eliminated these isolated refuges where this tree had previously survived during interglacial periods. This is a vegetation map of the southeast during the LGM that I’ve produced based on my complete study of available pollen records. Like all vegetation maps, this is a vast oversimplification. The solid black represents an environment dominated by the extinct Critchfield’s spruce. This region also included mixed hardwoods, extensive meadows, and some wetlands. Boreal species grew in the northern part of this region. Crosshatching represents a pine dominant environment mixed with oaks, other hardwoods, Critchfield’s spruce, grasslands, wetlands, and even patches of desert-like habitat including scrub oak and eolian sand dunes. The dotted region was likely bur oak and cedar savannah with some Critchfield’s spruce. To the north below the Laurentide Glacier was a mixture of boreal spruce forests, grassy steppes, and bogs depending on local conditions. The southern tip of Florida consisted of open pine savannahs and cypress swamps. It was out of phase with the rest of the continent due to a shift in the Gulf Stream–south Florida had warm wet conditions while the rest of North America had cold arid climate. Along the coast maritime oak, coastal prairie, and salt marsh prevailed. Partial list of northern fauna that colonized the southeast during the LGM. You are currently browsing the GeorgiaBeforePeople blog archives for September, 2011.